Hello everyone! 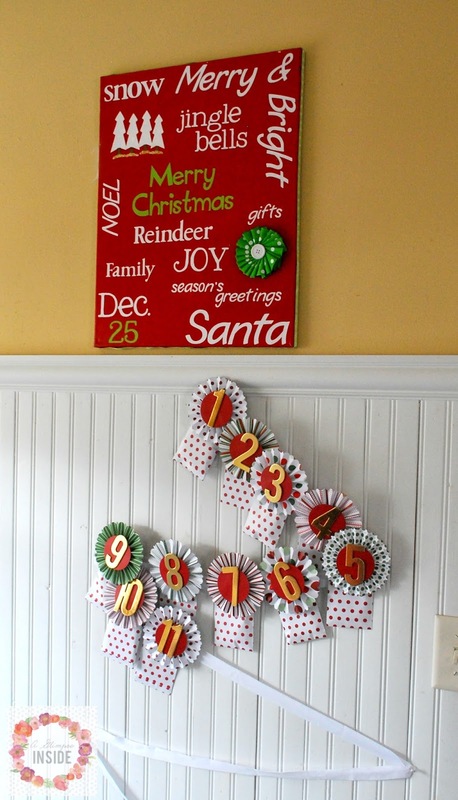 Can you believe Christmas is getting so close?! 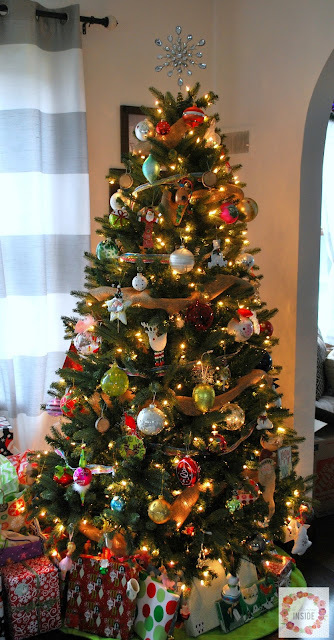 I have been wanting to take photos of all my decorations, along with lots of other things around the house, to share with you all for weeks now but the sun has seriously not come out in very long time around here and if it does, it is gone by the time I am all set up and ready for pictures. UGH! So I finally just sucked it up and took pictures even though I knew they would turn out horribly. 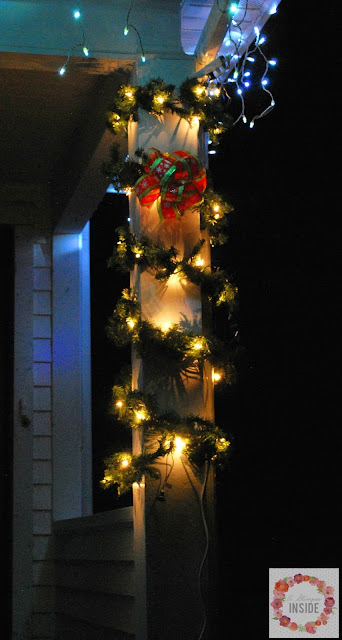 SO... here is how I decorated our new house for Christmas. I struggled figuring out what to use and where to put things in our new house but I think it all turned out pretty good. I will start in the living room. I tucked our tree in the corner of the living room before entering the dining room. This is the first year in quite some time that it has been front and center in our living space instead of in our old formal living area so the girls are enjoying the tree and looking at the ornaments and presents. I pretty much decorated it the same as I did last year. 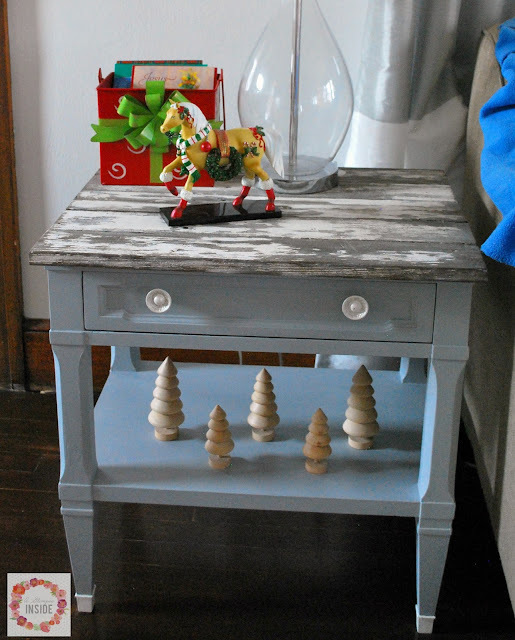 Things have been too crazy for me to think of another way to decorate it and I admit, I love all my ornaments too much to just change it up and not make them center stage. Even though you can't see it, I did buy a new tree skirt. 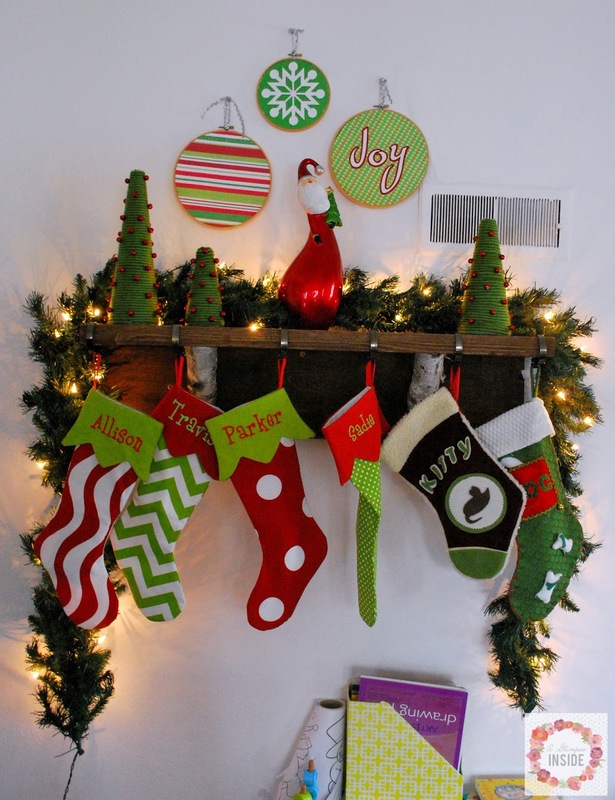 It is red and white chevron in the center outlined with the bright green. Moving to the opposite side of the living room, I hung our stockings on a shelf I had Travis build just for this purpose, seriously! lol I was decorating and thought I have no place for our stockings since we don't have a fireplace in this house and the shutters I used to use are now in the guest room, so I asked if he had any old wood and he had a large piece in the garage and whipped this up with some birch branches we had lying around as well. 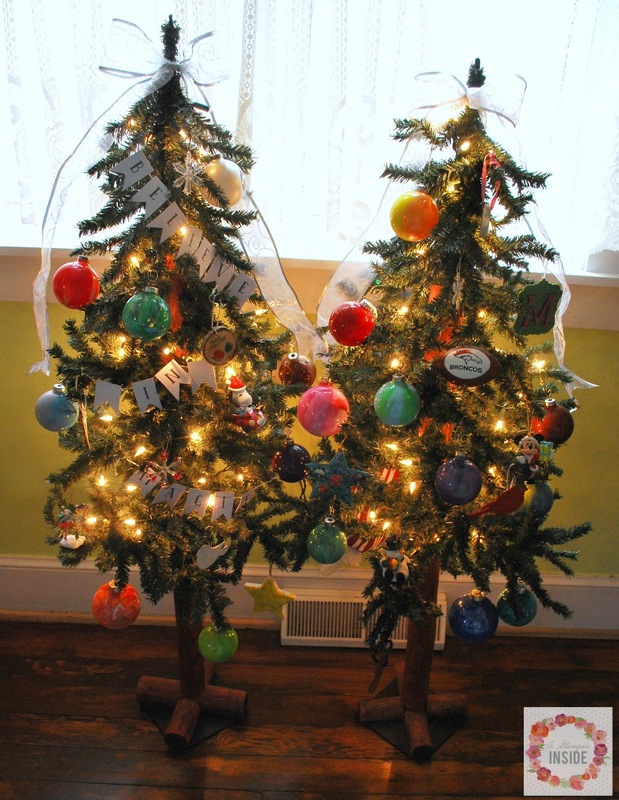 I decorated it with my yarn trees, a ceramic Santa, a garland, and then hung my embroidery hoop ornaments above it. For this being a total spur of the moment project, it turned out great! 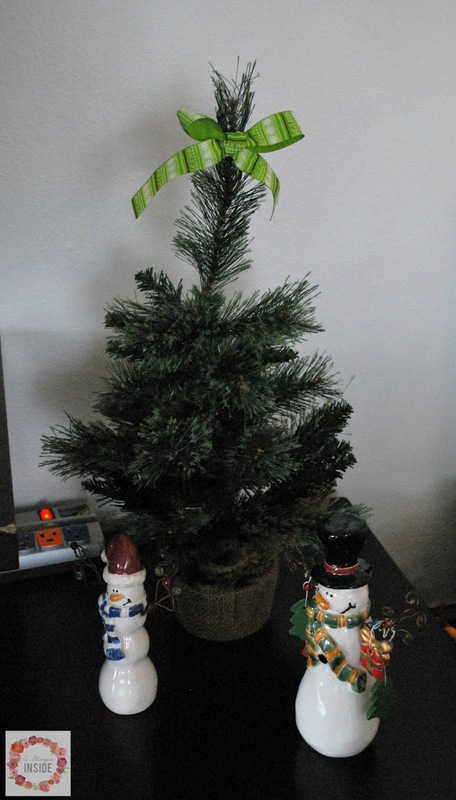 On our entertainment center, I placed this little tree along with some ceramic snowmen. 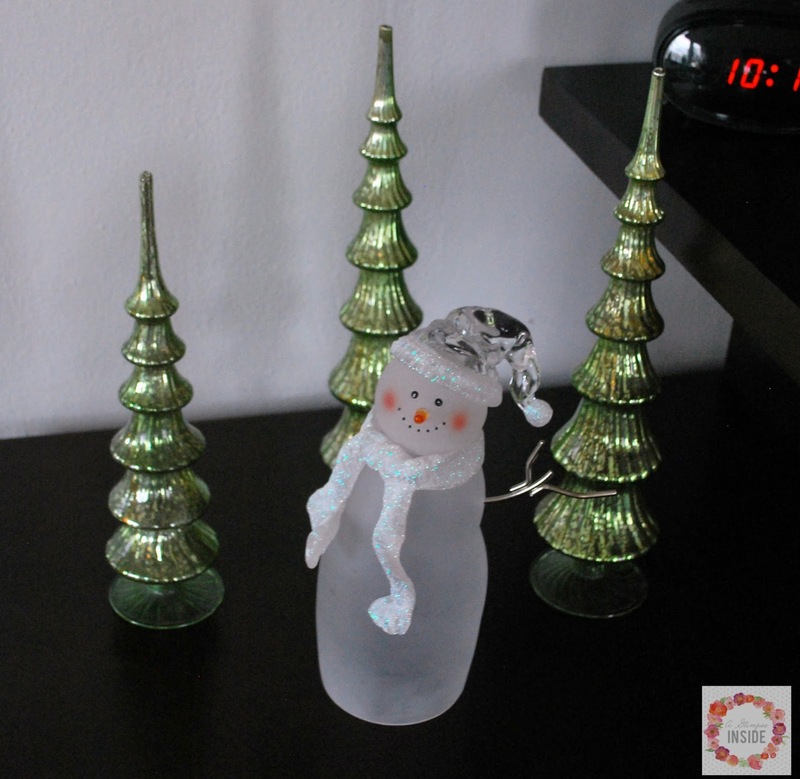 Then on the other side of the entertainment center, I placed these glass trees and snowman. On the wall next to the door that leads out to our porch, I hung my 25 plaque and my Reindeer Name Art. On the end table below the art I just placed the box that holds our Christmas cards as they arrive, a Christmas Painted Horse figurine, and simple wooden trees on the shelf below. Moving onto the dining room now I changed up the color scheme a bit. The living room turned out the be red, green, and white and the dining room turned into the bright, nontraditional colors like pink, blue, and green. 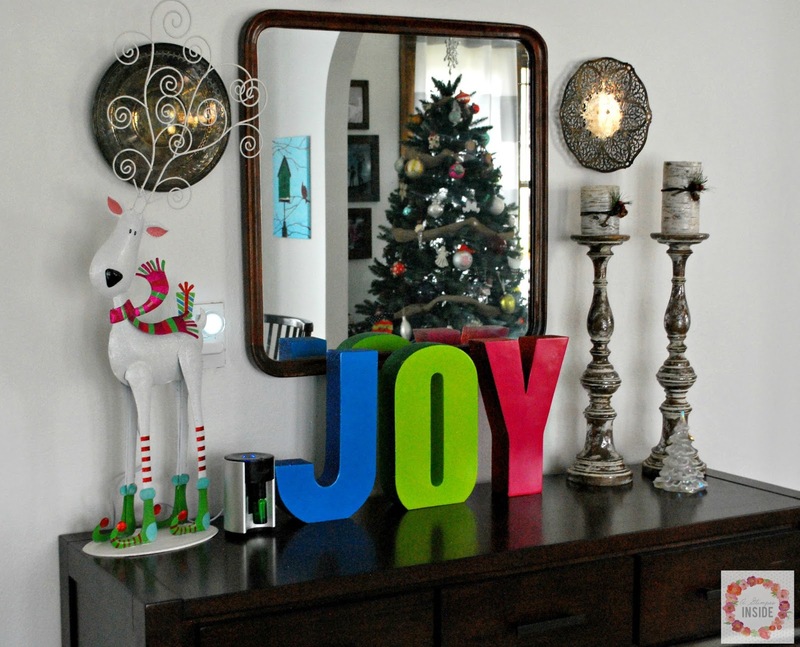 On the buffet, I place my large joy letters and my fun big Reindeer. I just changed out the candles on my candlesticks to faux birch candles and called it good. On the dining table I pretty much did my usual centerpiece of a table runner with some greenery and different candles. I then placed my kissing angels in the center to keep them out of reach of little hands. I also placed some small colorful ornaments in the greenery to tie in the color scheme. And as you can see in the background I hung my Glitter Ball wreath on the wall in the background. 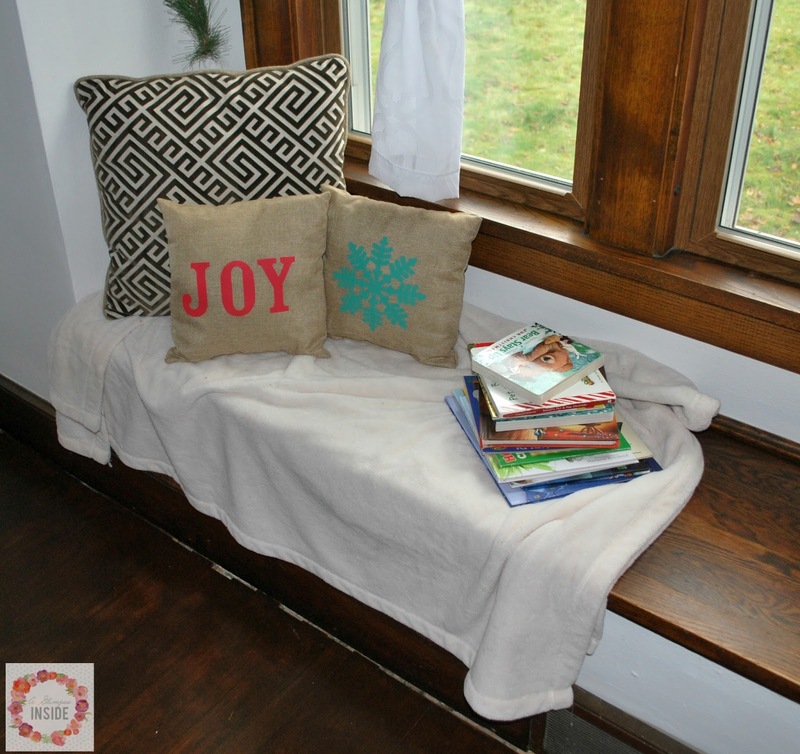 Over in the bay window I placed a fuzzy blanket, some pillows, and a stack of Christmas books to sit back and read a little. The girls love all the books out. Above the bench in the bay window I hung my fun colorful snowflakes from the ceiling. 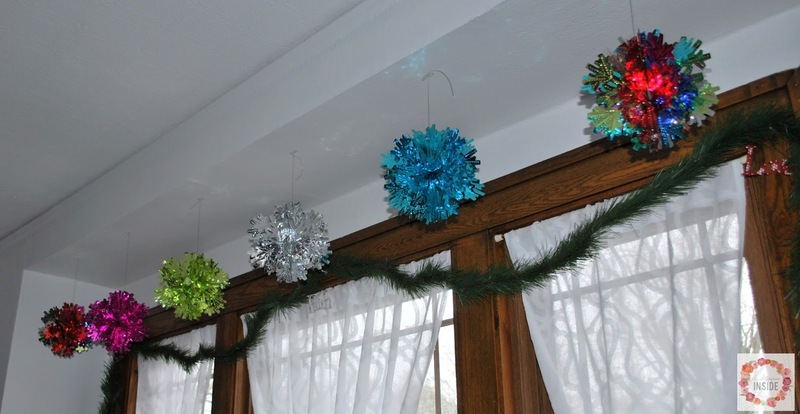 Then I hung some garland around the window to frame it out a little. In our mudroom, (that if the sun cooperates, I will finally take pictures of this space to show you the transformation), I placed our two small trees full of our handmade ornaments and other fun ornaments. 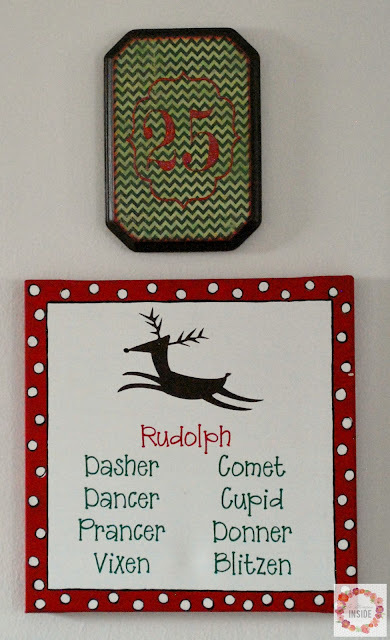 Then in the kitchen, next to our kitchen table I place our advent calendar and above it my Christmas Subway Art. 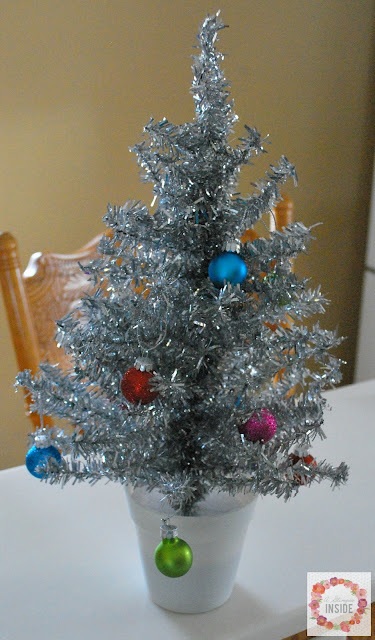 The kitchen is rather undecorated but this little tinsel tree does sit on the counter to add a little more fun to the space. I managed to get Travis outside as well to decorate the house. He put lights on the house then all down our fence as well. 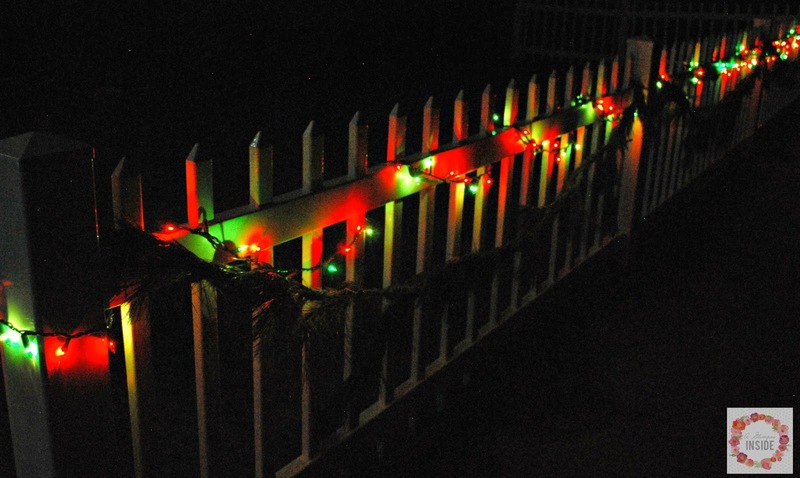 It is hard to see but along with the lights on the fence, I hung live garland as well. 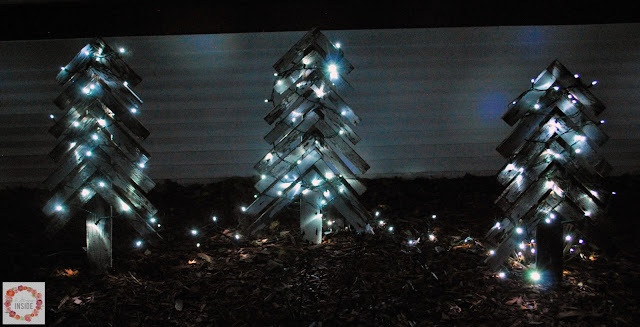 The rustic wood trees in our garden got some lights as well. 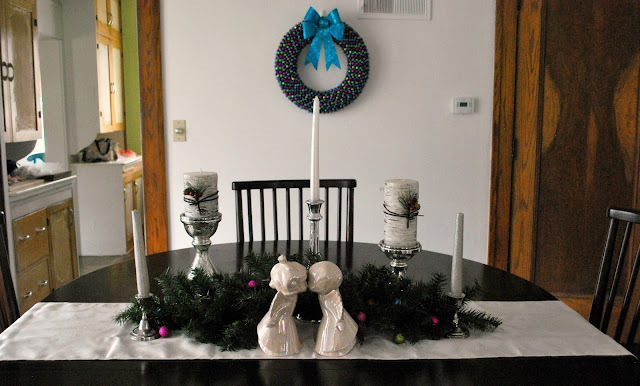 And lastly, some garland with a new bow wraps our porch column and then I made another bow to match and placed it on my live wreath on the door. And that's it! That is my holiday decor! Nothing super special but it makes our new home feel festive and the girls loved to help decorate and hang lights so that is all the really matters, right? !